TS 224 - sporty analog watch. Titnium Table. Kvartz mechanism. date, Cronogrf, stirring, ringing, time, lighting. Ring upper one-way rotating. water resistant: up to 200 meters. Double sealing. Diameter: 42 mm.Adi watches are quality timepieces produced in Kibbutz Yavneh in Israel. Wearing an Adi watch as a daily reminder of your love for the Land of Israel and its People. All Adi watches can be personalized for your simcha or as corporate gifts. Each watch is packed in an elegant silver colored gift box. 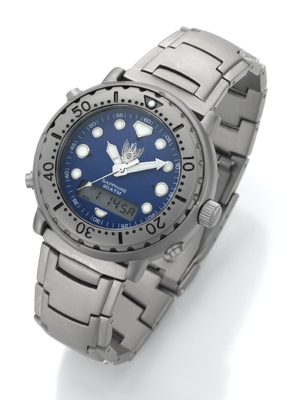 For an order of minimum 50 watches your own logo will be printed free of any charges on the face of the watch.